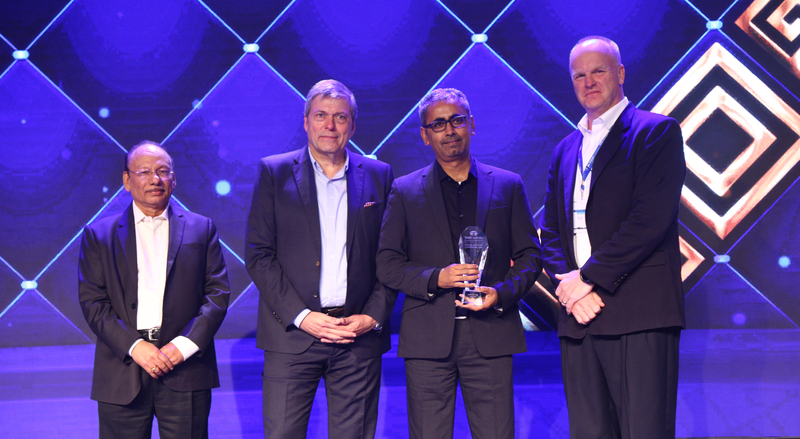 TROY, Mich., Oct. 30, 2018 – Inteva Products, a leading global Tier One automotive supplier of engineered components and systems, received an award for Agility at the 2018 Tata Motors Annual Supplier Conference in Colombo, Sri Lanka earlier this month. This is the first time Tata Motors has recognized suppliers in this category. Tata Motors Chief Executive Officer Guenter Butschek and Chief Procurement Officer Tom Flack presented the honor to Inteva's Sanjay Kataria, general manager, India. The new award was given to suppliers who executed quick build-up of additional capacity to meet increased production schedules without any interruptions. Winners also needed to demonstrate a strong commitment to adhere to program timelines during the product development phase for multiple platforms, a faster resolution of quality issues, and a quick response to engineering queries and new RFQs as per Tata Motors' expectations. Tata Motors nominated 16 suppliers in the Agility category; Inteva was one of five winners. Other award categories included Technology & Innovation, Sustainability, Efficiency, Quality, and Cost Competitiveness. Inteva has worked closely with Tata Motors since 2010. Tata Motors previously honored Inteva with the Best Supplier Award for Quality in 2015. Inteva Products is a leading global automotive supplier providing automakers with innovative, reliable, environmentally friendly products that enhance vehicle quality, safety and performance. Inteva has global resources for engineering, manufacturing and customer service for Closure Systems, Interior Systems, Motors and Electronics, and Roof Systems. Formed in 2008, the tier-one supplier is focused on achieving sustained global growth, providing excellent customer service and driving innovation. Inteva was founded on innovative solutions and the use of applied technology to drive value-based solutions. The company employs more than 12,000 people in 50 sites on five continents and maintains its World Headquarters in Troy, Michigan USA. For future company updates, please visit the Inteva Products website, or the company's Facebook, LinkedIn, Twitter and Instagram pages.